Background: Epidural steroid injection is widely used to treat the short and long-term symptoms of low back and radicular pain. To the best of our knowledge, the influence of transforaminal epidural steroid injection (TFSI) combined with caudal epidural steroid injection (CESI) on pain intensity, patient satisfaction, and quality of life in lumbar radiculopathy has not been examined. Aim: To evaluate the short and long-term efficacy of TFSI, and TFSI combined with CESI (TFSI + CESI) in patients with lumbar radiculopathy. Materials and Methods: We retrospectively examined the records of 104 patients with lumbar radicular pain and L4/5 and/or L5/S1 intervertebral disc disease who underwent TFSI or TFSI + CESI. We compared the pain intensity using a Visual Numeric Scale (VNS), North American Spine Society (NASS) pain satisfaction index, and EuroQol five dimensions (EQ-5D) quality of life scores before intervention, and after 1, 6 and 12 months. Results: In the TFSI group, the mean pre-treatment VNS score was 9.2, which improved to 4.9 after 1 month and to 7.2 after 12 months. In the TFSI + CESI group, the mean pre-treatment VNS score was 9.4, which improved to 2.6 and 4.6 after 1 and 12 months, respectively. Improvement in the VNS scores was significantly higher in the TFSI + CESI group (P < 0.0001 for each). Mean EQ-5D quality of life index in the TFSI group improved from 0.59 in the pre-treatment phase to 0.76 after 12 months of intervention, while it improved from 0.62 in the pre-treatment phase to 0.84 at 12 months of intervention in the TFSI + CESI group. 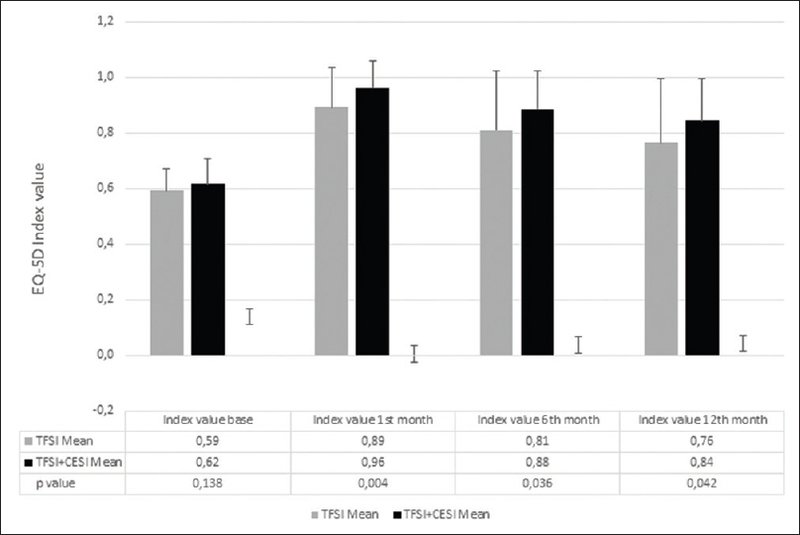 The EQ-5D scores were significantly better in the TFSI + CESI group at 1, 6, and 12 months after the procedure (P = 0.004, 0.036, and 0.042, for 1, 6, and 12 months, respectively). The NASS scores were significantly better in the TFSI + CESI group at 6 and 12 months after the intervention (P = 0.025 and 0.001 for 6 months and 12 months, respectively). Conclusion: In patients with lower lumbar radiculopathy, a combined TFSI + CESI technique offers superior short and long-term pain relief, quality of life, and long-term patient satisfaction, than when TFSI is performed alone. This article emphasizes the superiority of transforaminal epidural steroid injection combined with caudal epidural steroid injection technique in bringing about better pain relief, quality of life, and long-term patient satisfaction, than when transforaminal epidural steroid injection is performed alone. The utilization of epidural steroid injection in low back pain with radiculopathy not only helps in decreasing the nerve radicle inflammation but also facilitates the removal of and/or suppression of secreted pain and inflammatory mediators from around the nerve fibers. Our hypothesis was that although epidural steroid injection (ESI) blocks the nociceptive C-fiber conduction, the large volume (30 ml) of medication administered during the caudal epidural steroid injection (CESI) clears or dilutes the locally concentrated chemical irritants around the nerve roots. This washes out regional inflammatory mediators more effectively than the 2–3 ml volume given in a transforaminal epidural steroid injection (TFSI). 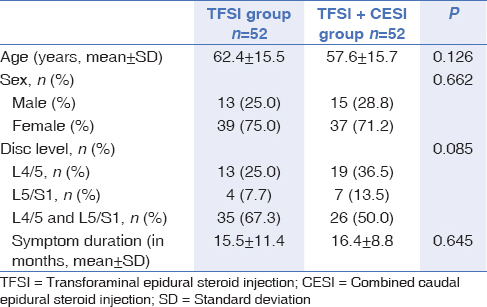 It has been reported that larger injection volumes are associated with better outcomes., The outcomes after epidural steroid injections (ESI) have been reported many times before, but the outcomes after TFSI, and after TSFI combined with CESI (TFSI + CESI) are administered, have not been compared. The aim of this study was to compare the outcomes obtained following the administration of preganglionic TFSI with those following the administration of TFSI + CESI in patients suffering from severe lumbar radiculopathy. We identified a cohort of 124 patients suffering from persistent unilateral or bilateral lumbar radiculopathy for at least 3 months, treated at our institution between September 2012 and June 2014, who had not responded adequately to conservative pain control measures. All the data were obtained retrospectively from medical records. This single-center retrospective study was approved by our local ethics committee and was conducted in accordance with the World Medical Association Declaration of Helsinki of 1964 as revised in 1983 and 2000. We included patients who had undergone TFSI or TFSI + CESI for their persistent lumbar radiculopathy. All these patients had imaging with magnetic resonance imaging (MRI) confirming the diagnosis of lower lumbar disc disease (at L4/5, L5/S1, or both). The patients were diagnosed to have nerve compression-related lumbar radiculopathy on the basis of imaging findings of disc degeneration, high intensity zones, foraminal stenosis, and/or disc herniation. Furthermore, physical examination was done to detect a positive straight leg raising test and the absence of motor deficit. The TFSI treatment was preferred in patients who had monoradiculopathy, while the TFSI + CESI treatment combination was performed for patients with multiple level radicular symptoms and two-level disc pathologies. We excluded patients with extruded or sequestrated lumbar disc herniation or disc herniation above the L4/5 level, as well as those with motor deficits, cauda equina syndrome, comorbid conditions that served as a contraindication to perfoming TFSI, a history of allergy to local anesthetics or corticosteroids, psychiatric or psychological disorders, previous spinal surgery, previous administration of ESI, post-traumatic nerve root compression or with evidence of infection, and those lost to follow up. All TFSIs and CESIs were performed by the same physician (T.C.) in an operating room equipped with a planar fluoroscope (Siemens, Munich, Germany) with the patient in a prone position. All the patients had intravenous access and hemodynamic monitoring. Sedation was provided with intravenous midazolam and fentanyl, as required. After sterile skin preparation and draping, the appropriate spinal level (and the sacral hiatus in those undergoing CESI) was identified, and the overlying skin and the underlying ligaments were infiltrated with 1% lidocaine. TFSI was performed using the preganglionic approach, as described by Lee et al., The landmark for needle insertion was slightly lateral to the pars interarticularis on the oblique view, and at the neural foramen near the site of nerve root impingement at the level above the adjacent disc, as seen on the radiographic posteroanterior view. A 9-cm 21-G spinal needle (Stimuquik insulated peripheral nerve block needle, Arrow International, PA, USA) was advanced towards the involved neural foramen under fluoroscopic guidance. When it was judged that the needle was correctly positioned, 1 ml contrast medium (Omnipaque 300; iohexol, 300 mg iodine per ml, Amersham Health, Princeton, NJ, USA) was injected to confirm the epidural flow. An intravascular, intradural or soft-tissue infiltration was excluded by obtaining the postero-anterior and lateral views [Figure 1]b. For TFSI, 0.5 ml bupivacaine hydrochloride (heavy marcaine spinal 0.5%, AstraZeneca, Istanbul, Turkey) was injected over approximately 1 min followed by 40 mg (1 ml) methylprednisolone acetate suspension (depomedrol, Eczacibasi Ilac San., Luleburgaz, Kirklareli, Turkey). In those who underwent TFSI + CESI, the caudal injection was performed during the same treatment episode. The sacral hiatus was identified between the sacral horns in the midline near the upper portion of the natal cleft. 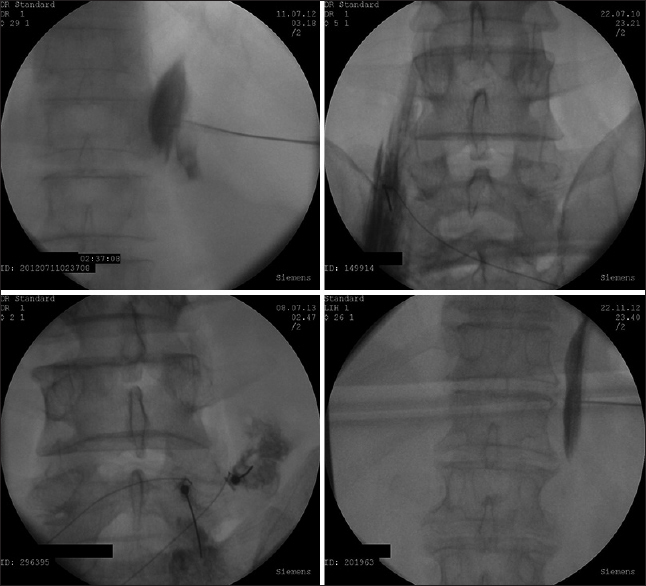 After infiltration anesthesia with 1% lidocaine, a 9-cm 21-G spinal needle (Arrow International) was advanced through the sacrococcygeal ligament, and then a further 1–2 cm within the caudal canal. The stylet was removed and the needle position was confirmed using contrast medium [Figure 1]a. For those undergoing TFSI + CESI, 0.25 ml of 0.5% heavy bupivacaine (AstraZeneca) was injected over approximately 1 min via the tranforaminal needle, followed by 20 mg (0.5 ml) methylprednisolone acetate suspension (Eczacibasi Ilac San.). Then, 0.25 ml of 0.5% heavy bupivacaine (AstraZeneca) was injected over approximately 1 min via the needle in the caudal space, followed by 20 mg (0.5 ml) methylprednisolone acetate suspension (Eczacibasi Ilac San.). Finally, 25 ml of 0.9% sodium chloride solution was administered over approximately 2 min via the caudal needle. Patients recovered in the outpatient clinic for 30–60 min after the procedure until they were physically and psychologically ready to go home. Patients were permitted to take paracetamol for rescue analgesia for the first 4 weeks after the intervention, but advised to avoid non-steroidal anti-inflammatory drugs. The efficacy of the interventions was assessed with Visual Numeric Scale (VNS) for pain intensity, EuroQol in five dimensions (EQ-5D) score for impact on quality of life, and North American Spine Society pain outcome (NASS) instrument  for patient satisfaction. VNS and EQ-5D were measured before treatment, and 1, 6, and 12 months after treatment. VNS measured the experienced pain intensity, with 0 representing no pain and 10 representing the worst pain imaginable. EQ-5D descriptive system comprises of the following five dimensions: mobility, self-care, usual activities, pain/discomfort, and anxiety/depression. Each dimension has three levels: no problems, some problems, or severe problems. In NASS, patients are invited to choose from one of four possible responses: 1 represents that patient's expectations had been completely met; 2 represents that improvement was less than hoped for, but that the patient would undergo the same procedure again; 3 represents that the procedure helped partially, but that the patient would not undergo the same procedure again; and 4 represents that the patient's condition was the same or worse than what it was before the intervention. Successful outcome was determined by the patient responding with a NASS score of 1 or 2. We compared VNS, EQ-5D, and NASS scores in patients who had undergone TFSI alone with those who had undergone TFSI + CESI. We recorded VNS and EQ-5D at the first clinical examination before TFSI or TFSI + CESI. A physical therapy and rehabilitation specialist, who was blinded to the pre-injection scores, assessed outcomes after 1 month of the procedure (short-term) using VNS, and EQ-5D and NASS patient satisfaction questionnaires. All the patients were involved in the rehabilitation program and were encouraged to perform passive exercises after the interventions. Patients were re-evaluated by another independent observer blinded to each patient's treatment after 6 and 12 months. At each follow-up appointment, the patients were subject to a neurological examination to detect short or long-term adverse events. The extent of correlations between the groups' pre-procedure and follow-up VNS, EQ-5D, and NASS scores were determined using the Pearson correlation test. The paired samples t-test was used to compare the means of the variables (VNS, EQ-5D, and NASS). For all other tests, P < 0.05 was considered statistically significant. All statistical tests were performed using the Statistical Package for the Social Sciences (SPSS) software (version 21.0; IBM, Armonk, NY, USA). We identified 124 eligible patients, but excluded 20 who were lost to follow-up. Of the 104 patients whose data were subject to analysis, 52 underwent TFSI alone and 52 underwent TFSI + CESI. The mean age of the patients in the TFSI group was 62.4 ± 15.5 years, while it was 57.6 ± 15.7 years in the TFSI + CESI group (P = 0.126). There was no difference in the gender distribution and the location of disc prolapse between the groups (P = 0.662 and 0.085, respectively). The mean symptom duration was 15.5 ± 11.4 months in the TFSI group and 16.4 ± 8.8 months in the TFSI + CESI group [P = 0.645, [Table 1]. Pain intensity improved in both the groups following injection. In the TFSI group, the mean VNS score before treatment was 9.2, which improved to 4.9 at 1 month and then was maintained at 7.2 at 12 months after the intervention. In the TFSI + CESI group, the mean VNS score before treatment was 9.4, which improved to 2.6 and 4.6 at 1 month and 12 months, respectively. 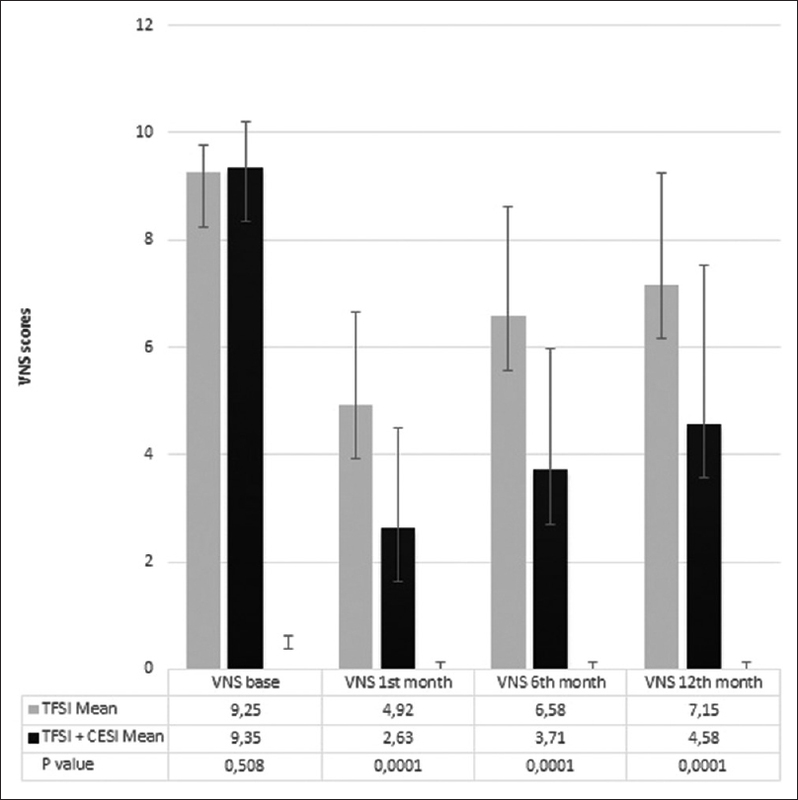 Pain VNS scores were significantly lower in the TFSI + CESI group at 1, 6, and 12 months after the intervention, and especially in the evaluation after a 1 month period [P< 0.0001 for each, [Figure 2]. There was improvement in the quality of life in both the groups; however, the improvement was greater in the TFSI + CESI group. The mean EQ-5D score in the TFSI group improved from a pre-treatment value of 0.59 to 0.76 at 12 months after intervention. In the TFSI + CESI group, the mean EQ-5D index improved from a pre-treatment value of 0.62 to 0.84 at 12 months. EQ-5D scores were significantly superior in the TFSI + CESI group as compared to the TFSI group at 1, 6, and 12 months, respectively [P = 0.004, 0.036, and 0.042, after 1, 6, and 12 months, respectively; [Figure 3]. 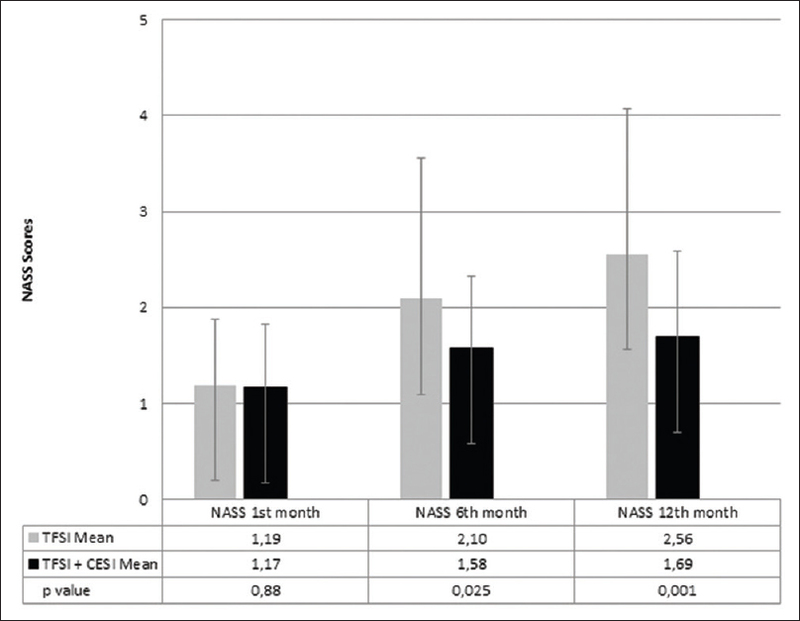 NASS satisfaction scores were significantly better at 6 and 12 months in the TFSI + CESI group (P = 0.025 and 0.001, respectively), but not after 1 month [P = 0.884, [Figure 4]. There were no immediate or late complications in either group, and there was no evidence of motor or sensory dysfunction of the lower limbs, or bladder or bowel dysfunction. We found that both TFSI, as well as the combination of TFSI and CESI were effective treatments for symptomatic lumbar disc herniation with radiculopathy. The combination of TFSI and CESI had superior short-term pain outcome, as well as superior long-term pain, quality of life, and patient satisfaction outcomes compared with TFSI alone. Our findings of short-term improvements concur with our clinical experience; however, our study highlights the long-term therapeutic benefits of adjunctive CESI with TFSI. A potential mechanism of action is that the large volume of injection given as part of the CESI, addresses and prevents adhesions from developing due to chronic compression around the nerve radicle, which may confer better long-term results than TFSI alone. Although this approach may not relieve inflammation as effectively as surgery does, TFSI + CESI is much less invasive, and hence is suitable for intervertebral disc pathologies such as annular disruption, high intensity zones, and disc protrusion. ESI is much less invasive than surgery, and can accelerate recovery in patients who do not respond to conservative treatment strategies. Medical treatment, physical therapy and ESI are used to accelerate healing, if urgent surgical intervention is not warranted. Fast and reliable results can be obtained with ESI techniques., However, both TFSI and CESI techniques have some risk of complications. TFSI treatment is a selective procedure for the nerve root, and it can be useful to detect radiculopathy. However, there are some observed complications such as spinal cord infarction that may develop after particulate steroid injection or needle tip displacement while performing intervention., Nonetheless, these issues can be prevented by contrast agent injection under fluoroscopic control and by bupivacaine injection to obviate vasospasm before steroid injection [Figure 5]. There are a few complications of CESI reported in literature, such as dural puncture and vascular injection. Additionally, hypotension and paraparesis can be seen following CESI. Some of our patients complained of transient rectal paresthesia during saline infusion into the epidural space. Majority of patients with lower lumbar radiculopathy will need to use traditional and/or anti-neuropathic analgesics at some point in their treatment, whether they undergo surgery or not. Many of these drugs are poorly tolerated, reduce the patient's ability to function normally and affect the quality of life. Physicians should choose the most appropriate injection method to ensure the best possible outcomes for their patients, and try to reduce the dose of strong anti-nociceptive or anti-neuropathic drugs. In the present series, therapeutic ESI was safe, and we did not observe any immediate or late complications due to the drugs administered or the injection methodology followed in our cohort of patients. It was traditionally thought that the characteristic pain that defines the disc disease is caused by direct compression of the nerve root by an intervertebral disc., Direct compression of the root causes local axonal damage and ischemia, but many studies have shown that the release of inflammatory mediators as a result of disc injury also has an important part to play. A degenerative disc, especially the nucleus pulposus, is a biologically active tissue that can trigger a chain of inflammatory pathological events. The genesis of pain is, therefore, influenced by inflammatory, biomechanical, and vascular phenomena in addition to direct compression. The nucleus pulposus is an avascular structure, is perceived as an antigen, and triggers an intense inflammatory response when it comes in contact with nerve structures. The radicle is particularly sensitive to mechanical irritation when it is inflammed. Consequently, the inflammatory process and the mechanical interactions between the intervertebral disc, the posterior longitudinal ligament and the nerve play a crucial role in the onset and maintenance of low backache and radicular pain. Given the anatomic relationships between these structures, it is important that a therapeutic injection be delivered using an appropriate concentration into the ventral epidural space. The main principle underlying the use of ESI in low back pain with radiculopathy is the removal of and/or suppression of secreted mediators from around the nerve fibers. Dorsal root ganglia are more sensitive to mechanical rather than to chemical irritation. We elected to use the preganglionic approach to inject the solution close to the ventral surface of the nerve radicle to improve the efficacy of the treatment. A limited volume of injection can be delivered to this space by TFSI alone, and the technique is reliant on the expertise of the operator and the patient's anatomy. This may explain the large discrepancy of outcomes reported in studies examining the efficacy of TFSI in the literature, and also the potential benefit of adding CESI. Previous studies have shown that pre-ganglionic TFSI is effective in the short-term but not in the long- term period. It is not clear whether the additional benefits conferred by CESI, that were evident in our study, are brought about by the disruption of adhesions, irrigation of the epidural space, and dilution or removal of inflammatory mediators, or by another, currently unidentified, mechanism. Our study had some limitations. Our cohort was relatively small, patients were not randomized, and functional assessments were not made. The study was not prospective. Only patients with a lower lumbar disc herniation were enrolled in this study to provide similarity between the two groups. Consequently, the TFSI + CESI technique should still be used with caution, after carefully explaining the potential risks and benefits to patients. Further studies will be needed to validate our results. The strength of this study was that a single investigator performed all the interventions, and hence our findings were not influenced by inter-operator variability. Our retrospective study found better short and long-term outcomes in terms of pain relief, quality of life, and satisfaction in patients with lumbar radiculopathy who underwent TFSI + CESI when compared to those who underwent TFSI alone. Manchikanti L, Boswell MV, Singh V, Benyamin RM, Fellows B, Abdi S, et al. Comprehensive evidence-based guidelines for interventional techniques in the management of chronic spinal pain. Pain Physician 2009;12:699-802. Manchikanti L, Boswell MV, Datta S, Fellows B, Abdi S, Singh V, et al. Comprehensive review of therapeutic interventions in managing chronic spinal pain. Pain Physician 2009;12:E123-98. Lievre JA, Attali P, Gautier JC, Michel J. Treatment of lumbar backache and neuralgia with subarachnoid hydrocortisone. Rev Rhum Mal Osteoartic 1955;22:671-7. McLain RF, Kapural L, Mekhail NA. Epidural steroid therapy for back and leg pain: Mechanisms of action and efficacy. Spine J 2005;5:191-201. Viner N. Intractable sciatica. The sacral epidural ınjection; An effective method of giving relief. Can Med Assoc J 1925;15:630-4. Brown JH. Pressure caudal anesthesia and back manipulation. Conservative method for treatment of sciatica. Northwest Med 1960;59:905-9. Nelson DA, Landau WM. Intraspinal steroids: History, efficacy, accidentality, and controversy with review of United States Food and Drug Administration reports. J Neurol Neurosurg Psychiatry 2001;70:433-43. Jeong HS, Lee JW, Kim SH, Myung JS, Kim JH, Kang HS. Effectiveness of transforaminal epidural steroid injection by using a preganglionic approach: A prospective randomized controlled study. Radiology 2007;245:584-90. Lutz GE, Vad VB, Wisneski RJ. Fluoroscopic transforaminal lumbar epidural steroids: An outcome study. Arch Phys Med Rehabil 1998;79:1362-6. Riew KD, Yin Y, Gilula L, Bridwell KH, Lenke LG, Lauryssen C, et al. The effect of nerve-root injections on the need for operative treatment of lumbar radicular pain. A prospective, randomized, controlled, double-blind study. J Bone Joint Surg Am 2000;82:1589-93. Ghahreman A, Ferch R, Bogduk N. The efficacy of transforaminal injection of steroids for the treatment of lumbar radicular pain. Pain Med 2010;11:1149-68. Manchikanti L, Cash KA, Pampati V, Falco FJ. Transforaminal epidural injections in chronic lumbar disc herniation: A randomized, double-blind, active-control trial. Pain Physician 2014;17:E489-501. Byun JM, Park HS, Woo JH, Kim J. The effects of a forceful transforaminal epidural steroid injection on radicular pain: A preliminary study. Korean J Pain 2014;27:334-8. Lee JW, Kim SH, Choi JY, Yeom JS, Kim KJ, Chung SK, et al. Transforaminal epidural steroid injection for lumbosacral radiculopathy: Preganglionic versus conventional approach. Korean J Radiol 2006;7:139-44. Lee JW, Kim SH, Lee IS, Choi JA, Choi JY, Hong SH, et al. Therapeutic effect and outcome predictors of sciatica treated using transforaminal epidural steroid injection. AJR Am J Roentgenol 2006;187:1427-31. Manchikanti L, Cash KA, Pampati V, Damron KS, McManus CD. Evaluation of lumbar transforaminal epidural injections with needle placement and contrast flow patterns: A prospective, descriptive report. Pain Physician 2004;7:217-23. Ritter PL, Gonzalez VM, Laurent DD, Lorig KR. Measurement of pain using the visual numeric scale. J Rheumatol 2006;33:574-80. Rabin R, de Charro F. EQ-5D: A measure of health status from the EuroQol Group. Ann Med 2001;33:337-43. Daltroy LH, Cats-Baril WL, Katz JN, Fossel AH, Liang MH. The North American Spine Society lumbar spine outcome assessment instrument: Reliability and validity tests. Spine 1996;21:741-9. Cansever T, Kabatas S, Civelek E, Kircelli A, Yilmaz C, Musluman M, et al. Transforaminal epidural steroid injection via a preganglionic approach for the treatment of lumbar radicular pain. Turk Neurosurg 2012;22:183-8. Makkar JK, Singh PM, Jain D, Goudra B. Particulate vs non-particulate steroids for transforaminal epidural steroid ınjections: Systematic review and meta-analysis of the current literature. Pain Physician 2016;19:327-40. Gharibo CG, Fakhry M, Diwan S, Kaye AD. Conus medullaris ınfarction after a right L4 transforaminal epidural steroid ınjection using dexamethasone. Pain Physician 2016;19:E1211-4. Dere K, Akbas M, Bicerer E, Ozkan S, Dagli G. A complication during caudal steroid injection. J Back Musculoskelet Rehabil 2009;22:227-9. Hamamoto H, Miyamoto H, Doita M, Takada T, Nishida K, Kurosaka M. Capability of nondegenerated and degenerated discs in producing inflammatory agents with or without macrophage interaction. Spine 2012;37:161-7. Wang JC, Lin E, Brodke DS, Youssef JA. Epidural injections for the treatment of symptomatic lumbar herniated discs. J Spinal Disord Tech 2002;15:269-72. Spaccarelli KC. Lumbar and caudal epidural corticosteroid injections. Mayo Clin Proc 1996;71:169-78. Heyse-Moore GH. A rational approach to the use of epidural medication in the treatment of sciatic pain. Acta Orthop Scand 1978;49:366-70. Howe JF, Loeser JD, Calvin WH. Mechanosensitivity of dorsal root ganglia and chronically injured axons: A physiological basis for the radicular pain of nerve root compression. Pain 1977;3:25-41. Wilson-MacDonald J, Burt G, Griffin D, Glynn C. Epidural steroid injection for nerve root compression. A randomised, controlled trial. J Bone Joint Surg Br 2005;87:352-5. Mulleman D, Mammou S, Griffoul I, Watier H, Goupille P. Pathophysiology of disk-related sciatica. I.--Evidence supporting a chemical component. Joint Bone Spine 2006;73:151-8. Desai MJ, Dua S. Perineural hematoma following lumbar transforaminal steroid injection causing acute-on-chronic lumbar radiculopathy: A case report. Pain Pract 2014;14:271-7.